It wasn’t long ago that I was posed a rather difficult question. The question came from a senior in high school who was struggling with the fact that a lot of their friends were atheist or did not want anything to do with God or religion. It is a challenging question and a very difficult one especially if you have grown up in a denomination that it not too vocal when it comes to evangelism… cough cough the Episcopal church cough. As some of you know, one of my hobbies is playing disc golf. I began playing in high school and have continued playing to this day. I have even convinced many of my friends to begin playing. We go out and play whenever we find the time, which isn’t always too often but we always do enjoy the times that we are able. Naturally, whenever I say anything, he goes out of his way to do anything else. Sometimes it works out for him but a lot of times it doesn’t. By now it has just become a running joke whenever we play and always adds some humor into the round. It didn’t start off as being so funny…it was actually pretty annoying and I must admit to it cause some frustration. As frustrating as that answer may be, it was his true honest response. And you cannot not argue with someone else’s honesty. Well, you can but in this case I didn’t think it was worth it. Pick your battles, right?! Now, I remember a quote that somebody told me a while back. A smart person will learn from their own mistakes. A wise person will learn from the mistakes of others. This is an example of great advice that you hear and welcome with open arms…and then struggle to follow it. Now, I am going to ask a serious of questions and I want you to answer them as honestly as possible. You can answer them quietly in your head, so be as honest as you possibly can because no one will hear it. Remember that time you did something that you thought was a really good idea? It may have been that person you dated briefly? That thing that was going to look really cool... if you were able to do it? But what do they know…this time will be different, things won’t happen like that. Why should you listen to them? What do they know about that particular situation? Typically, the situation works out the same way. Friend A tells friend B that their idea is probably not smart. Friend A does not listen and does it anyway. Friend B, being a good friend, stands by their side. Afterwards, friend B fights the urge to say, “Told you so” while friend A says, you were right. So how many situations can you think of that fit that model? Probably a few right? After going through this many times myself, I have developed some ideas about this. Sometimes, we just need to learn things on our own. When our friends or family are telling us that something may not be a good idea and advise us not to do something. They say it is something so simple and it just makes sense! Why won’t you listen? Whatever the reason is, we are not ready to heed their warnings or take their advice. We hear what they say but it does not fully sick in. We just may not be in a place where we want to hear it. That is when we just have to be there for them. We can’t just continue to tell them that they are wrong because that just pushed them into doing the exact opposite of what we are saying. In time, when they are ready to hear, when the time is right, they will get it…and we will be there for them the whole time. To me, that how evangelism should work. They more you push your beliefs onto someone, the farther you will push them away. 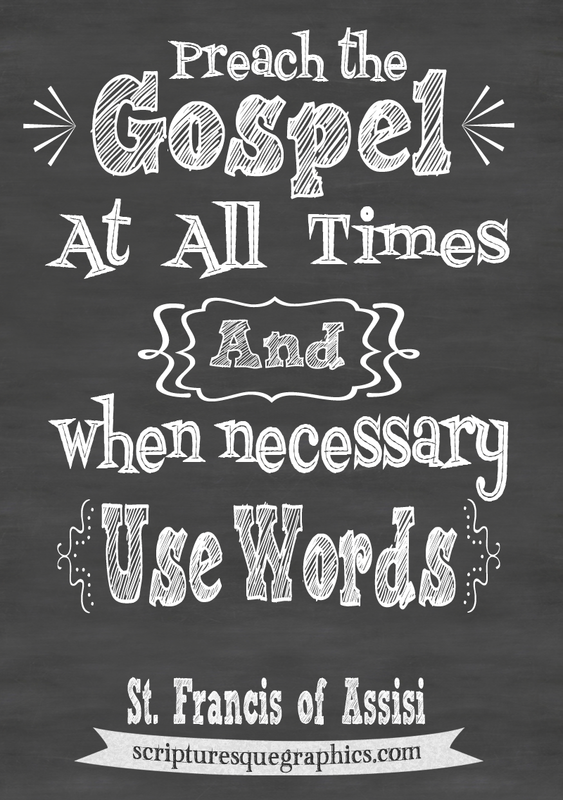 Just because our words may fall on deaf ears it does not mean we cannot still live out the Gospel. Have you heard the cliché, actions speak louder than words? If you only speak the words, you can be ignored…but if you live it, then people will notice. But remember, you can force someone to be ready to hear it, when the time is right and they are ready, they will know that they can come to you and talk about it.